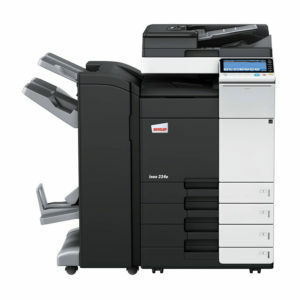 The Lexmark XM7155de MFP with a customizable e-Task touch screen provides print, copy, fax, email and scan functions. Included are a 500-sheet offset stacker, 1,200-sheet standard input, 1GB of standard memory and a 320+GB hard disk. Use the front USB Direct print port to store scanned documents and print directly from a flash drive.